A friend of mine asked me to bring a vegetable dish to a wedding open house for her daughter who was married out of town. I decided to see what I could actually do that would befit the occasion. 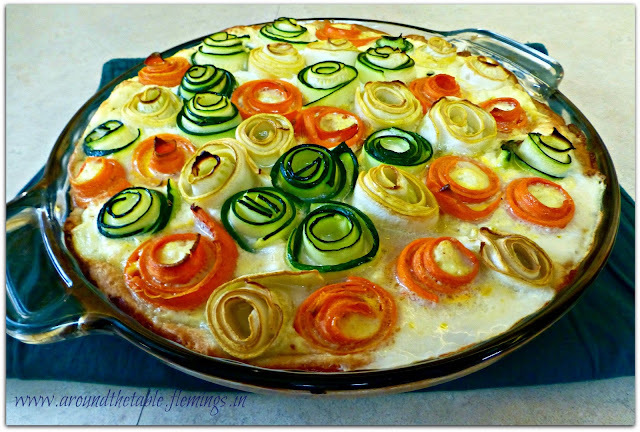 That's when I found this recipe for a Zucchini and Carrot Roses Tart. It was beautiful, but could I make something like that? I decided to try. Of course, I had to fiddle with the recipe some. I decided to use crescent roll dough out of the can instead of puff pastry. Since I didn't have multi-colored carrots, I decided to use yellow summer squash as well as zucchini and orange carrots. I also added more salt and pepper. Unroll dough and press into tart or pie pan on bottom and up sides. Trim excess. Mix together ricotta cheese, eggs, parmesan and salt in medium bowl. 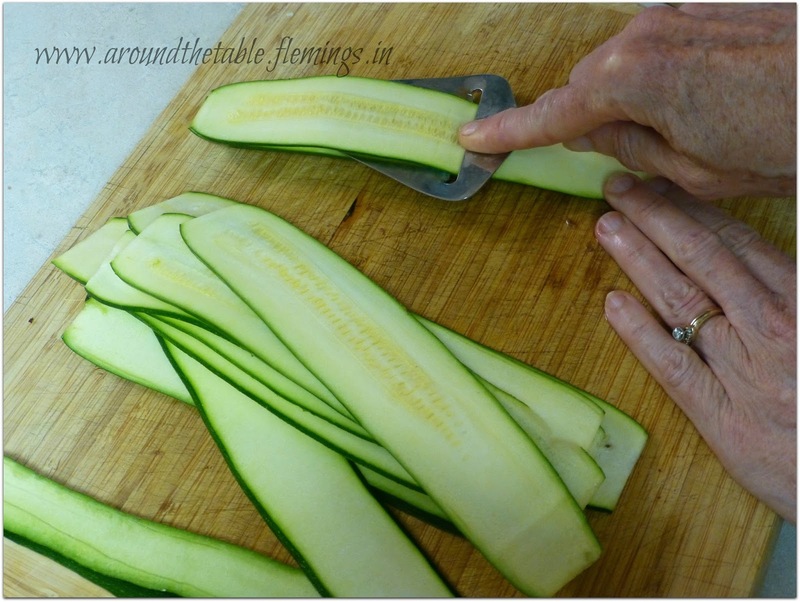 Slice carrots, zucchini, and summer squash into thin lengthwise strips. Spread cheese mixture on top of dough. Warm half vegetable strips in microwave for 20-30 seconds. This makes them more pliable. 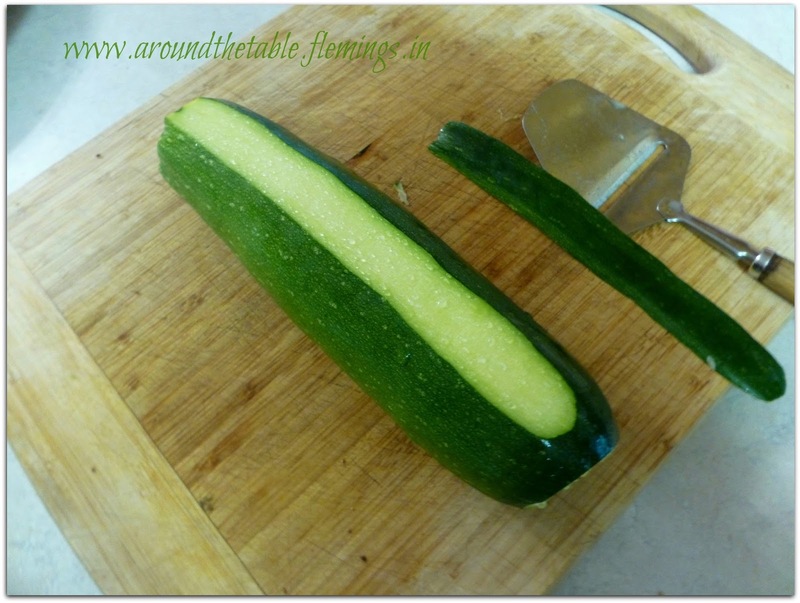 Choose one vegetable strip and roll it into a spiral. Add another strip of the same vegetable around it to make it into a rosebud. Place the vegetable bud upright into the center of the cheese. The cheese mixture will hold it in place. Choose a different vegetable and make another rosebud. Place the varied colors of vegetable buds in the cheese creating a spiral starting from the middle toward the outer edge. Squeeze as many as you can in. Warm the other half of the vegetables in the microwave and continue until the pan is full. Brush the tops of the vegetables with the olive oil. Sprinkle the oregano and pepper over the top. Bake at 375F for 45-55 minutes until the vegetables are tender. Allow to sit for 5 minutes before cutting. Cut into wedges or squares. Makes 8-10 servings. For printer ready version click here. 1. Since I did not have a mandolin or other vegetable slicer that would slice the vegetables, I used a cheese slicer. 2. Warming the vegetable slightly in the microwave (20-30 seconds) would make using a cheese slicer easier. 3. 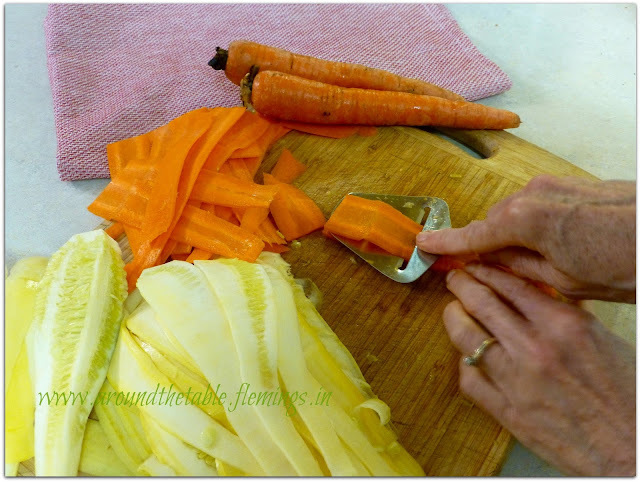 I sliced once lengthwise then turned the vegetable over to make the bottom flat in order to keep the vegetables steady as I sliced them. 4. If there are a lot of seeds in the center, do not use the part with seeds. 5. 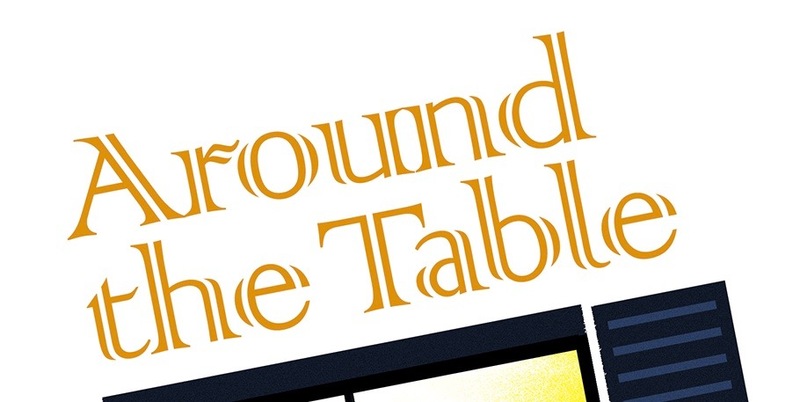 For the center ring, a carrot/potato peeler makes a thinner slice that is easier to roll and then the thicker slice can be wrapped around that spiral. 6. When placing the spirals in the cheese, place the open end toward another spiral that is already placed to help it stay shut. Beautiful work of art, Sharon. You have such good ideas. Keep it up! This looks delicious. My mother-in-law used to make something like this with ground beef in it. She called it hamburger pie. The vegetable were just cut up instead of arranged in rosebuds. It was always delicious! 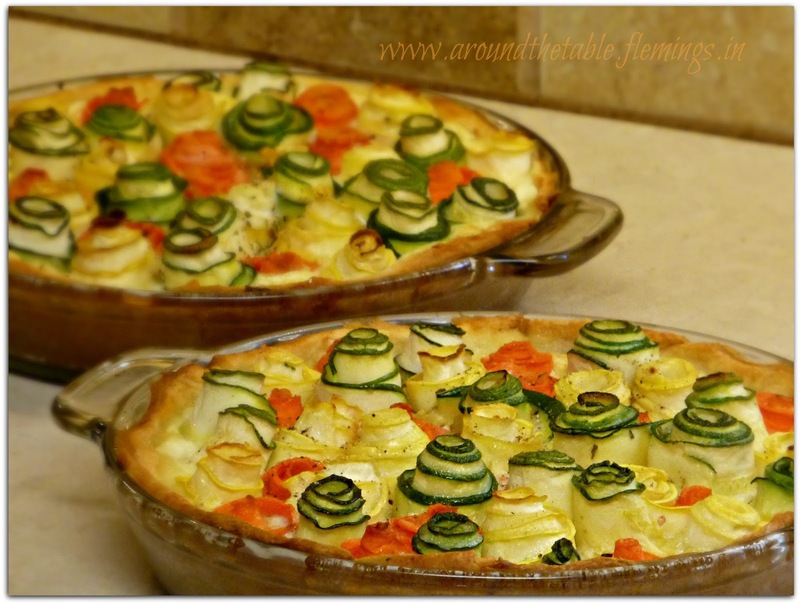 recipe looks perfect for my vegetarian kids and grandkids. so glad to know crescent tolls can sub for puff pastry, which i find hard to work with. I have a vegetarian in my family too, so I'm always looking for recipes. I agree that I was glad about the crescent rolls...I've never actually tried puff pastry and don't even know where to look for it in the grocery store! Wow!! This is beautiful and I bet everyone loved it. You did such an awesome job & perfect for the occasion. Yum! What a pleasure it will be to make this tasty recipe in my own kitchen! 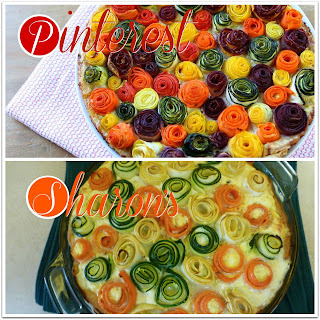 I am so delighted that you shared these healthy and delicious Rosebud Vegetable Tart with us at the Healthy Living Link Party. I'm Pinning and sharing this! You are welcome! 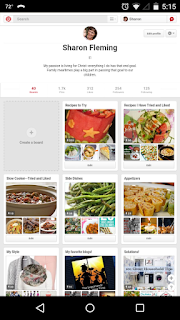 Thanks for Pinning and sharing! Hi Sharon! 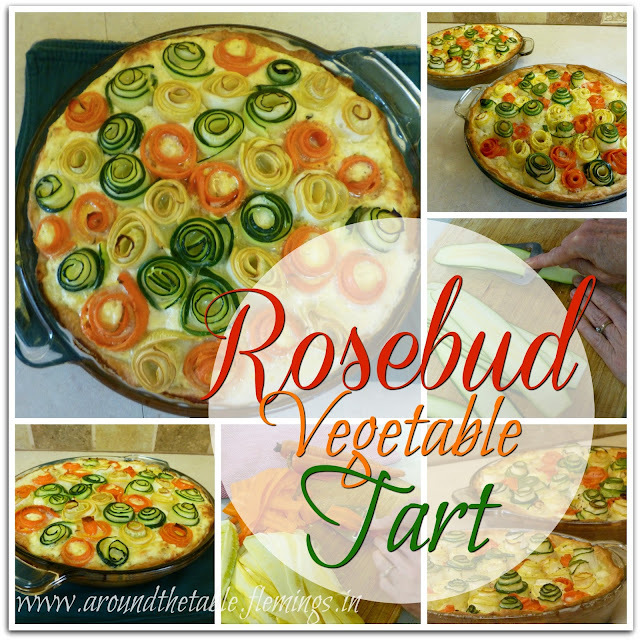 I loved this rosebud vegetable tart. Finding this recipe was important for me, since I always feed myself only with healthy food. Thanks for sharing. What if Your Vision of Heaven is All Wrong? Every Night--I Promise It Works!